Launched into orbit on June 11, 2008, the Fermi Gamma-ray Space Telescope (formerly GLAST) is our newest major space observatory. 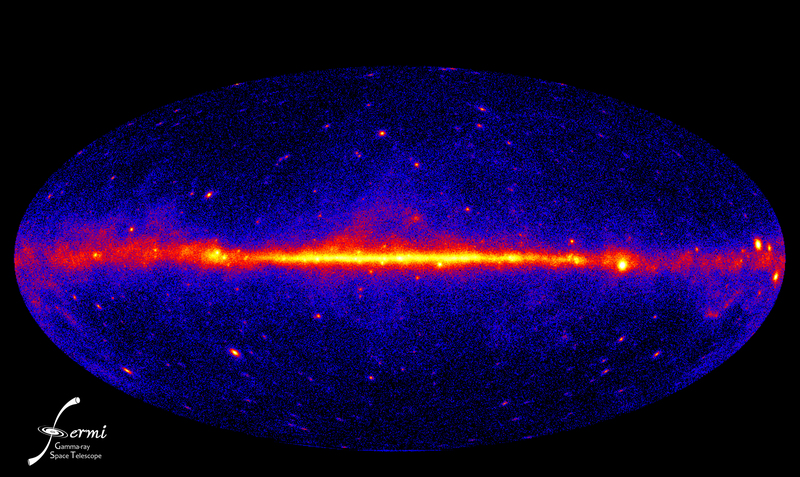 Fermi views the Universe through high-energy gamma rays. Gamma rays are beyond blue light, ultraviolet and even X-rays on the electromagnetic spectrum (otherwise known as the rainbow). 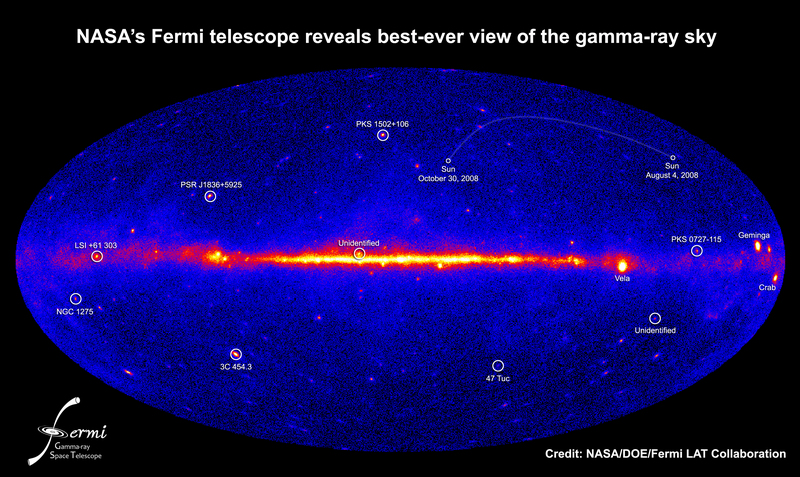 The wavelength of gamma rays are far too short for our eyes to see but the Fermi Gamma-ray Space Telescope has specifically designed cameras that can “see” this light. Being able to detect and correlate gamma rays gives us exciting images of unprecedented detail that enable us to render vivid false color representations. The bright band across the center of the image is an "edge-on" view of emission from our Milky Way galaxy. The emission is created when charged particles known as cosmic rays smash into the tenuous gas between the stars. Individual strong sources of gamma ray emission are also visible in the image, including rotating collapsed stars known as pulsars, and jets from super massive black holes in the cores of distant galaxies. Gamma-rays are often generated by violent, energetic events. Most of the cosmic gamma rays that we see from pulsars and black holes are created when very strong magnetic or gravitational fields accelerate charged particles to very high energies. This image from Fermi shows an all sky map. The map is based on galactic coordinates gathered from an accumulation of data over one year of observations. Every orbit during the year added another layer of information.